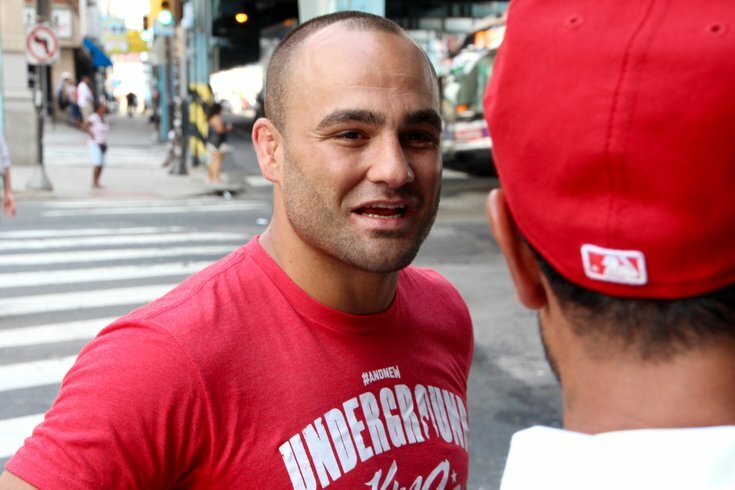 Former lightweight champ Eddie Alvarez talks to a fan while walking through his old Kensington neighborhood late last summer. Eddie Alvarez is sick of talking about the one thing he seems to be asked about most often since the Kensington native won the UFC lightweight title last month. Alvarez is awaiting the result of McGregor's rematch with Nate Diaz at UFC 202 on August 20. After that, he's hoping to defend his title against the winner of that fight and is eying a November bout at Madison Square Garden -- he previously said he wanted his next fight to be in Philly, but because of scheduling conflicts at the Wells Fargo Center, that dream has to be put on hold for now. There is, however, something the 32-year-old is never shy to talk about, something he wears proudly like a badge of honor rather than a scarlet letter: the city that helped shape him from a boy working in a shoe-store under the El into one of the most feared men on the planet. "I think that whenever a kid doesn't have resources [around him] he's forced to be resourceful. And I think the best trait you can have inside a cage is your ability to adapt and change and be resourceful. That's an intangible that I have that sets me apart from other fighters. I've been [forced to be resourceful] for so long, that's where my real experience is -- in always finding a way. "And I think that's rooted in growing up in Kensington and not having much." One example of that resourcefulness came during Alvarez first UFC win back in June of last year -- he had previously won a belt while fighting for Bellator -- when he beat Gilbert Melendez by split decision despite not being able to see out of one eye for 10 of the fights 15 minutes. After breaking his nose and left orbital bone, Alvarez admits being more scared then he ever was in the octagon, not because of the injury, but because he lacked the depth perception to properly detect just how far away Melendez was from him. But given where he's come from, there's no questioning his toughness and determination. We met not far from where Alvarez grew up (around G and Westmoreland) at the corner of Kensington and Allegheny — don’t worry, Alvarez referred to it as K&A — to take a literal trip down memory lane, the same streets the champ used to run through to get to school as a third grader. With the train tracks overhead providing a brief respite from the oppressive August heat, we began walking down Kensington Ave.
We hadn’t gone more than a block before it started happening. A blaring car horn isn’t exactly a foreign sound on this store-front lined street. But this wasn’t a get-out-of-my-way honking. It had more of a hey-look-at-me quality, something that became fairly obvious when the driver yelled “Hey Eddie!” and raised his cell phone to catch a shot of the fighter referred to as the Underground King. And this continued for as long as we kept walking down the street. There were no cameras, no other media, nothing to tip off the rest of the world that this was anyone other than another guy from the neighborhood. Yet, save for the trio of guys who accused us of being cops, it was almost like Alvarez never left. But Alvarez did leave -- and he considers himself lucky for having made it out of an area that has progressively worsened in the years since he lived there. The North Catholic grad now lives in the Morrell Park section of the city, not far from the Northeast Regional Airport, with his wife, Jamie, and four kids, who range in age from 11 to two years old. Returning to his old stomping grounds did stir up some emotions. "There's definitely a feeling of gratitude," Alvarez said. "It's a little bit sad seeing the desperation, the lack of resources going on in Kensington itself. But when I look at my own situation -- my family, my wife and kids -- I just feel gratitude for where we're at, the life I'm able to provide for them. I couldn't be more blessed. ... I guess some nostalgia too, but also it's changed a lot." As we approached an electronics store, Alvarez started to slow down as if he noticed something — or someone — familiar. “Hey, man. Do you remember me? I used to get stuff from you all the time when I was younger,” he said as the old man’s eyes began to light up. “Yes, yes. You’re all grown up now!” the man replied, completely unaware that the kid he recognized from years ago was now a world champion fighter. To him, Alvarez was just another kid from the neighborhood. It's a shame that comparing a Philly fighter to Rocky has become so cliche, because if there was ever one who deserved that comparison, it's Alvarez. Walking through Kensington with him was reminiscent of the training montage in Rocky II, when Sylvester Stallone is running through the streets of Philly and is bombarded by fans cheering him on and, eventually, hundreds of kids chasing after him. Ultimately, Alvarez hopes that kids follow in his footsteps as well. On Tuesday night, Alvarez hosted an event at Chickie's and Pete's in South Philly for friends, family and fans to celebrate his big win -- he had been out on a media tour for UFC, one that came with first-class plane tickets to go with that 13-pound belt. He spent time with every fan, signed a ton of autographs, and even gave away as many shirts as he could find. The next day, Alvarez was in Camden to speak with underprivileged kids attending the Sixers community basketball clinic. All 900 kids in attendance received free shoes courtesy of Nike, but more importantly, they were given some very important life lessons from guys like Alvarez and Sixers head coach Brett Brown. And one camper, Isaiah, got a special birthday gift from the fighter. Alvarez's message was simple, and one that he tries to hammer home to his own children on a daily basis: Don't ever let someone tell you that your dreams are unattainable and never, ever be afraid of failure. "When I speak to kids, I try to let them know that it's OK to fail," he said over lunch, after spending his morning at the Salvation Army in Camden. "It's perfectly fine to fail, and that's going to be part of the process of becoming a champion. Embrace it, know that it's going to happen, and over come it. If they can do that, then they'll continue to make themselves vulnerable and continue to grow. If they can't then they're probably going to live a safe life and never achieve their dreams." It's not just something he believes in, it's something he practices as well. "I made a poster board with my wife and kids back when we were in our first house," Alvarez recalled. "We got magazines and we cut out everything we wanted. I said, 'Anything you want, if you see it in a magazine, cut it out and put it on your board. This is your dream board, you can have whatever you want. ... At that point, I cut out that I wanted to be Top 5 fighter in the world because at that time, I wasn't even ranked. I put a house, a bigger house for my kids, on there. I saw a bathroom I liked and I put that on there too. It was just images of things I wanted. And my kids did the same. "I don't have the poster board any more, but I think about it to this day. And I'm like, 'F**k, I have everything on there that I want and more. So I just try to tell kids that there are really no obstacles. There's nothing that is impossible. If you can think about it, and you obsess about it enough, and you work hard, you can achieve it. It's that simple. We don't need to let things get in the way." After all, he's living proof that nothing is impossible.